Keep up on the weather tomorrow, especially if you are camping, boating or engaged in some other outdoor activity. Saturday is going to be a very busy day, unfortunately. Please figure this into your holiday plans! In the purple area, there is a high risk of damaging thunderstorm winds that will be accompanied in some areas by large hail. Power failures and trees blocking roads are a real possibility. The highest winds will occur from the Ozarks into western Kentucky. High winds will continue farther east. Note: The storms will be very fast-moving. Do not assume you are safe because the storm is 50 miles away. In the western part of the area, from I-35/I-135 to the Ozarks is where tornadoes are also possible. 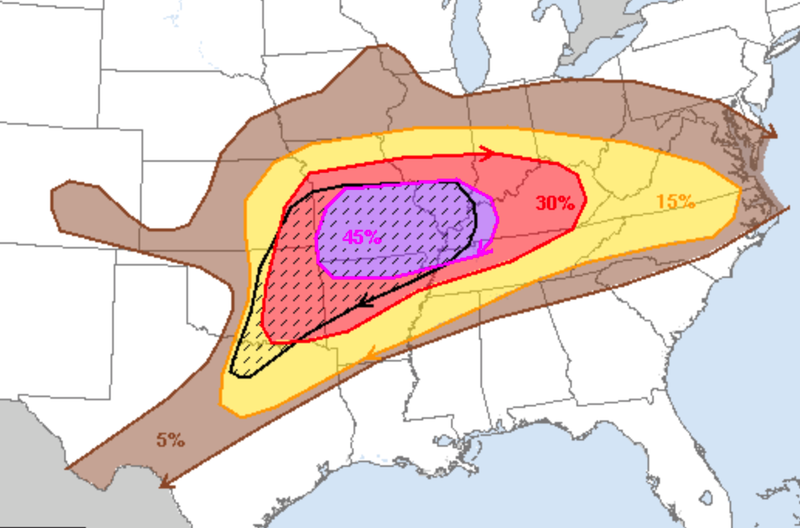 The significant threshold for severe weather on this map is 15% (yellow). The hatched area is where the most violent storms are expected.